The Irrawaddy: Welcome to The Irrawaddy office Mr. Ambassador. We appreciate your accepting our invitation to discuss issues relating to Myanmar and the region. We thought we’d ask you if you’d like to kick start the session? US Ambassador Scott Marciel: I was at Dagon University this morning to give a speech to the students on US policy toward Myanmar. I emphasized two points: One is [that] US policy toward Myanmar is in the context of US policy in the broader Indo-Pacific region. This is a policy of engagement and support for ASEAN and democracy, peace and prosperity. We have been very consistent, going as far back as the 1988 uprising, to support people’s efforts to build democracy, as well as peace and prosperity. Two is that – and I think it will be surprising to some people— much of these discussions in Washington over the years have been as much from the heart as from the head. What I mean by that is that we recognize Myanmar is strategically important, but for the most part over the years, the tremendous interest and support for democracy in Myanmar has been out of our admiration and respect for the incredible sacrifices that so many people here have made in the struggle to bring about human rights and democracy and rule of law. That has been a really important factor, and remains a very important factor in our policy. Those are two of the points I made this morning, and I stressed that despite some challenges and disagreements, particularly over the last 18 months, the goal of our policy is still consistent: to support efforts to build democracy and peace, democratic federalism, and prosperity, as well as friendship between our two countries. We are curious about your thoughts on constitutional amendment in Myanmar? Of course, we’re following it with great interest. We have said many times that there are many elements in the current Constitution that are not really consistent with full democracy. Obviously it is up to the people of Myanmar to decide what they want in terms of amendments. We don’t want to get involved in the political debate over this. But we think efforts to try to bring about reforms, to develop and strengthen democracy, seem to be what the public wants. And that is the positive thing. We don’t know how it is going to play out, of course. But it is quite interesting to see. And if it results in more dialogue, discussions, debates, and a stronger constitution, a stronger more democratic constitution, that’s a good thing. How would you characterize Myanmar-US relations under President Donald Trump’s administration? Well, I think it remains very much about us doing everything we can to support the efforts of people here. As I said, our policy has consistently been to build democracy, and build prosperity, support peace, and federalism. So we are doing all of those things just as we were in the previous administration. Obviously, we have had some challenges and some disagreements, particularly over things like Rakhine, in the last 18 months, but the underlying commitment to support the democratic transition and development of rule of law remains strong. We are still doing all of our programs to support this; [they] remain funded going ahead. As you know, China is gaining increasing leverage in terms of the peace process, investment and its Belt and Road Initiative. What is your opinion on this? Well, this is really up to the government and people of Myanmar. China is very active here. It’s promoting a lot of big projects. And the US Government is not here because of China, or against China. We are here to support Myanmar. For me, what’s important is what the people of this country want. When it comes to big economic projects – whether funded by China or by anybody else – what I hear from the people here and what I hear from the government is: “Is this in Myanmar’s interest? Is it a good project? Is it going to the follow rules? Is it going to hire local people to do the work? Is it going to protect the environment? Is it going to lead to debt?” Those are questions that I would think, and that I am pretty confident, that the government is asking, not only for Chinese-funded projects, but for any big projects. We are here trying to do what we can to support the country and build our friendship. Myanmar has China as a neighbor. So it is normal and natural that the Government of Myanmar has spent a lot of time working on that relationship. We have learned that China is not happy with your recent visit to the northern part of the country, especially to Kachin State. I am the ambassador to the Union of Myanmar, and I am accredited to the entire country. My job is to represent the United States in your entire country, and that’s what I’ve been doing, and what I will continue to do. I don’t think any country wants a third country to tell it who can visit within its own borders. State Counselor Daw Aung San Suu Kyi was once a darling of the West, and the US was one of the strongest advocates of ending her house arrest under the previous Than Shwe regime. Are you surprised to see Daw Aung San Suu Kyi’s administration moving so much closer to China? Are you surprised by that? I am not surprised that this government or any government would feel that it is in Myanmar’s interest to make sure to have a good relationship with China. And I think that is normal and appropriate. Obviously some things have happened—particularly the Rakhine crisis—that have created some challenges in the relationship between this government and the West. But again for us, what matters is what Myanmar country going to do, not is this country going to have a good relationship with China. We are not in a contest here, or in the rest of the region. There would never be a situation where we say: “Choose between us and China.” There is no reason to choose between the two. Myanmar should have a good relationship with China. We hope Myanmar also has a good relationship with us and with other countries. But what we want to focus on is what we can do to support Myanmar’s democratic transition, and to support human rights. Sometimes this leads us to be fairly outspoken in our criticism, which can be popular at times and not so popular at other times. We think it is: a) true to our own values, and b) necessary for Myanmar to succeed as a democracy. Just as we in the United States have to deal with some problems we had internally with our treatment of some of our people. Nowadays the United Nations Human Rights Council and some Islamic organizations are pushing to have Myanmar brought before the International Criminal Court. In the coming years the international pressure will likely grow. You have already met with foreign officials here. What impression do you get from them? Do they think this effort is serious? I don’t want to speak for other governments, but for us, we think that after the August 2017 ARSA [Arakan Rohingya Salvation Army] attacks—which of course we condemned as did most other governments—the military’s response was disproportionate and resulted in widespread human rights violations. What we’ve been urging since then is access, and a full and credible independent investigation to get out all the facts of what happened. And then accountability to the extent that investigations show there were significant human rights violations. This is normal, particularly for such a large-scale crisis that resulted in 700,000 people fleeing the country. Unfortunately, access was largely denied and there was no investigation. Many different bodies have tried to find out as much as they could – what the facts were, what the evidence was – but they have been handicapped by the lack of access inside the country. And so what we are still really hoping for is for the truth to come out about what happened. We hope the people of this country, as well as the international community, could all generally agree on what the facts are. That is the goal. Once we have the facts, then for there to be accountability for those abuses that took place; there’d be some justice. Ideally this would be led by a Myanmar domestic investigation, done in a way that is credible. Not only credible in the eyes of the international community, but also credible to the people in general. The hope all along is that the facts come out in a credible way, and that there be some justice based on those facts. That is what this is really all about. The goal isn’t to pressure Myanmar just to pressure Myanmar; it is to try to get the facts out. Unfortunately, as I said, access has not been allowed and there hasn’t been a credible investigation. We hope that the independent commission’s inquiry can produce these facts as much as possible. I think that will be good, not only for the international community, but for Myanmar. With regard to your support for peace and democracy, you have been supporting civil society groups and ethnic groups. What is your assessment or impression of the current formal peace process? I would say a couple things. First, as you know, Myanmar has maybe the most complicated peace process, certainly the most complicated set of conflicts that I’ve seen. I always try to be careful because I understand that this is complex, and not easy to resolve. There are so many different actors involved, and that is really challenging. We have supported the formal peace process from the beginning, including the NCA [Nationwide Ceasefire Agreement], and the idea for political dialogue which produce some commitments on federalism and democracy. Obviously it is really challenging and there are many difficulties to achieving progress. In some ways, this is to be expected. What’s important is to keep the dialogue going as much as possible, and to minimize any conflicts that happen while the dialogue is ongoing. My own view is that there is still a lot of work to do to really, fundamentally understand the thinking and the goals of the different groups. I think there’s still a pretty wide gap between the different sides about what the fundamental issues are. That presents a huge challenge, and it is going to take more time and a lot more dialogue. Despite these challenges, we hope that people will keep trying and bring more people into the discussions, not necessarily formally, but informally as well. You mentioned the domestic actors. Turning to the international actors, you know that under former President U Thein Sein’s government, we had different players in the peace process. Then-US Ambassador Derek Mitchell was there, the Chinese were there—sometimes in the back seat and sometimes in the front seat. We have seen other international players performing very important roles as messengers, including the UN special envoy, who was here engaging with stakeholders. They tried to contain the conflict. But now it seems this messaging is missing, and the key actors have disappeared. Now it is much more confusing and complex. China seems to be coming to the forefront, and in some ways to have hijacked the whole peace process. Would you agree? I only want to speak for my government, though I think several other governments feel the same way. We want the peace process to succeed. We want to support it any way we can. It is a peace process led by the Myanmar government, and we respect that. We are constantly asking the government and others what we can do to help, and are willing to help in any way we can. We keep a regular dialogue with a lot of the actors in the peace process. We don’t ever tell the Myanmar Government what to do, or say “you should do this” or “you should do that.” We simply encourage continued dialogue and as much restraint as possible. Meanwhile, we are doing a lot of work with ethnic political parties and sometimes particularly with the signatories [to the NCA], to provide training on federalism and build capacity for negotiations. In addition to this, we remain ready and willing to help any way we can. You went to Rakhine State recently and met with state lawmakers. What were their views on the fighting between the Myanmar military and the Arakan Army (AA)? I don’t want to speak on behalf of the [state] speaker. 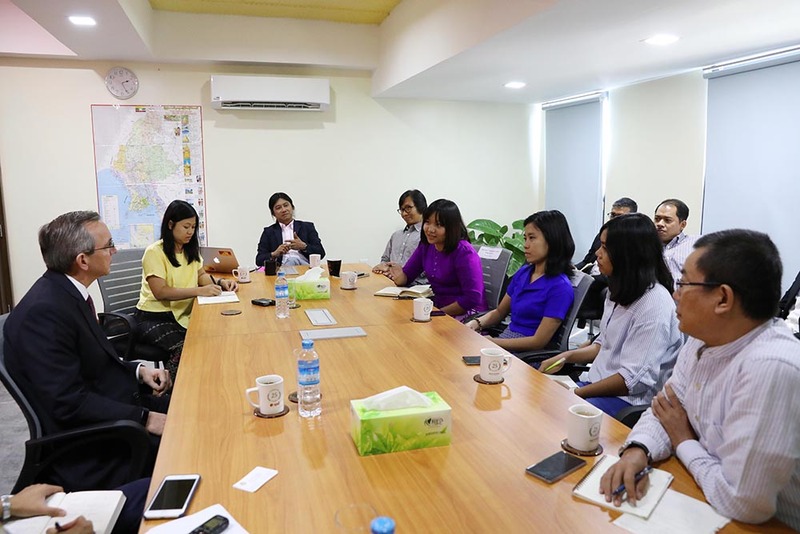 But what I would say is we met with a lot of people from the Rakhine community, including political figures, and the main message we got was that there seems to be quite a bit of support among the Rakhine community for the Arakan Army. There was concern about what they allege were human rights violations [by] the Tatmadaw in the conflict with the AA. What we heard the same thing we had heard before the Arakan Army really increased its activity, which is complaints that the ANP [Arakan National Party] had won the election in 2015 but did not feel like they had sufficient voice in the government. I am not agreeing or disagreeing. I am just sharing that this is what we heard in general. A lot of frustration. Did they tell you anything about their political stand? Whether they take the side of the AA or the government? You have used the term “dialogue” several times. In fact there has been no actual dialogue in our country over the past 30 years, though we have seen many meetings. I am talking more about the high-level meetings between Daw Aung San Suu Kyi and Senior General Min Aung Hlaing, the chief of the Myanmar military (or Tatmadaw). They have had more than a dozen meetings. But we cannot call this dialogue; maybe they met to create the impression of dialogue. It is a type of deception aimed at the world and the Myanmar people. We have not seen any concrete reason. What is the solution for our country? That is a good question. It is obviously a big question. For 50 years, the people of this country did not really have the ability to talk about issues in any kind of open way. We all know that. So even though a lot of things have changed, and there is a lot more ability to talk these days than there was, change does not happen quickly. It does take a long time, and it takes time to develop a habit of dialogue that goes beyond just reading official points. I have been in a lot of negotiations, and you never resolve problems by reading your points. You usually make progress over dinner, where you put away your formal notes and talking points, and begin to have conversations and build trust. It takes a certain amount of trust and some listening to really understand the other side’s perspective, and once you have that trust, you can begin to make progress. As I said before publically, progress requires going into the conversation acknowledging that maybe your view isn’t always 100 percent correct, acknowledging that maybe the other side has some valid points. If it’s just a debate, you know it is not going to resolve too much. I don’t want to sound arrogant here, because we don’t always go into conversations with this mindset either. Going back to our civil rights movement, we didn’t make much progress for a very long time. We made some progress, and then we realized we still have a long way to go. Through informal dialogue we’re giving people exposure to different communities, different ethnic groups, and hopefully building more understanding, so that over time we’ll build trust and empathy that will help to achieve progress in the formal talks. Maybe you don’t agree 100 percent with another position, but you will at least understand what their view is. It takes time, and it takes a lot of work to actively bring different people together, not just for formal talks, but for dinner and at other informal settings. In that case, it would seem that political will is the key. We have been talking about the formal peace process—the visible proceedings—and you have mentioned the need to bring in other stakeholders in more informal ways. Talking to people who are very close to the peace process, “informal” seems to mean different things to different people. The ethnic armed organizations (EAOs) have one definition, and the government side has another. They don’t have a common understanding on that. When they say “informal meetings” there are always conflicts that don’t get resolved. I know there are differences from one country’s peace process to another, and definitions of “informal negotiations” vary, but what are the possible definitions? It is a really interesting question. Informal meetings should mean that ideally you [have] an informal setting. The idea is that you can talk a little bit more openly. You are not negotiating, so you can just exchange ideas and offer some ideas that you are not bound by later. You haven’t committed to something; maybe you can try this. To me it means people sitting around, ideally away from a formal negotiating table, and exchanging ideas and trying to build a little bit of trust. It has to mean people have to feel comfortable that whatever they say isn’t going to be repeated by the spokesperson the next day to the other side. They feel confident sharing ideas or expressing their concerns; that to me is “informal meeting” and in any negotiating process, including peace process, you have to have a lot of those discussions. You have regular contact with some of the ethnic groups. People always say they are working for their people’s interest, when there is also another interest of their own. What should the armed groups—including both the Tatmadaw and the EAOs—what kind of comprise should they seek to overcome the current deadlock in the peace process and peace building? Well, it is a challenge, because of the history and the way things have developed. You have ethnic armed groups who are speaking on behalf of their whole ethnic group. And in an ideal world, you would have political parties doing that, but that is not the way your history has evolved. So it’s best for them to be consulting extensively with their own communities. In the previous election, we saw a lot of funding and support for independent media as they sought to raise critical issues. But over the last two years, we see that a lot of embassies here have curtailed that and are now shifting their resources more into the civil society arena. What is the strategy here? When your government, and others like yourself, look at the upcoming election, and two or three years ahead, do you see the media playing a crucial role? Those are good questions. On the first, while I am not sure what other embassies are doing, we can continue to give strong support to independent media. It is absolutely critical. For us, it is not media vs. civil society. Both have a crucial role in any democracy, so we will continue to support both, as well as continuing to support the Union Election Commission, because they also have to do all the technical work — voter lists and everything else. We, along with other embassies, are already engaging directly with the Union Election Commission. I want to stress, our engagement is only on the technical support side, not getting involved in politics, per se. Because I think the 2015 election generally was quite good — not perfect, but quite good. Our elections also aren’t perfect. And we certainly want to do what we can to help on that front. We believed that the Ministry of Information—particularly under this elected government—would be downgraded to an Information Department. But the opposite has happened. The ministry is still spending a lot of money on propaganda. I’ve heard that same concern from plenty of people and I think this is a very legitimate issue for the public to debate, and going into the election, it’s not for me as a foreign official to say there should be or should not be this ministry. I think it is part of the democratic debate; what do we mean by free media, independent media, what is the role of government? And it is not surprising in a new democracy to have a debate. I expect many people will talk about it in the lead-up to the elections. What do you think about press freedom in our country? Is the current situation worse than under former President U Thein Sein’s administration? I think about it a couple ways. I think it is dramatically better than it was from the first few times that I visited here in 2005, 2006, and 2007 of course. I try to remember that. I guess, we’ve expressed concerns about some restrictions on press freedom and the arrest of journalists for what in our view is doing their jobs as journalists. Whether it is 66(d) [of the 2013 Telecommunications Law] or other provisions of the laws, it’s a concern. We have said consistently that an independent free media is essential to building democracy, so we are concerned about that for sure. Last year The New York Times published a report on the military’s shadowy Facebook campaign, run by an operation based outside of Naypyitaw. There is a cyber battalion stationed there. They use infotainment and entertainment websites to attract thousands of followers and can turn these into hate campaigns. According to the NYT, the Tatmadaw is behind it. Would you comment? Yes, certainly. There are a couple of issues here. One is hate speech and disinformation through social media, which is present in Myanmar and other countries—including the United States—as one problem. The second is the extent to which officials, military or otherwise, you know, for officials to speak up publicly is part of their jobs. To the extent that the officials, including military personnel, are behind the scenes anonymously, sending out messages meant to divide or create political tension, that is deeply troubling and really should be of concern to everybody, I think. It is absolutely inconsistent with rule of law, democracy and the appropriate functions of any government. Have you raised the issue with your counterparts or even with military officials? I don’t think I’ve raised exactly that point, but I’ve certainly raised concerns about hate speech – and, again, we have it too in the United States — but hate speech by anybody is always troubling. But particularly if it turns out people in the government and military are behind it, that is even more troubling. What percentage of US humanitarian support to the Indo-Pacific region goes to Myanmar? We have a couple of different categories. Overall USAID assistance, which is broadly development assistance, is about US$120 million [183.7 billion kyats] a year in grants. That mostly goes to health, anti-malaria, anti-tuberculosis, maternal and child health, those sorts of issues. In the agriculture sector, a lot of it is working directly with farmers. And then a fair amount is what we call broadly “governance,” which is support for independent media, civil society, some federalism workshops—those sorts of things, some capacity building for parliament, work with the attorney-general’s office and supreme court; again it is capacity-building. $120 million generally is for development assistance. We have a small amount of separate money from the State Department that goes to work with some of the police who are doing anti-narcotics, or anti-human trafficking, those sort of programs, and a separate budget, relatively small, for exchange programs and scholarships. And then we have humanitarian assistance, and there is not a set number for that. It depends on the situation. So if any country has a natural disaster or something, there is a general pool of money that we can pull from to try to address that. We put in a fair amount of money, tens of millions of dollars, this year for IDPs in Kachin, northern Shan, Rakhine and those still in the southeast as well. And then separately, literally hundreds of millions of dollars for people who fled this country as refugees, not only in Bangladesh, but still a lot of support for Karen, Shan, Kayah refugees in Thailand. The idea of a narrative is a big problem in this country; we are missing a national narrative whenever we have a crisis. And surprisingly, particularly under this government, when you look at the Rakhine crisis, it seems there is a missing narrative. I agree. As I said earlier, this crisis happened; without getting into all the details, there clearly was significant violence and a large number of people fled. And unfortunately a year-and-a-half later, we still have a Myanmar narrative of what happened and an international narrative of what happened, and they are very far apart. That makes it really hard to make progress. My own view is, ARSA carried out the initial attacks. That’s a fact. We’ve condemned it. It was a disaster both because they attacked police and because of what it led to. There was a disproportionate response. Of course any country has the right to respond to an attack like that; nobody would suggest that they should have done nothing. It was the way in which it was done – rather indiscriminately and quite brutal, and with subsequent denial – that was really, really troubling. Myanmar’s not the first country whose security forces have had human rights violations. Ours have too. What we would have hoped to see is more recognition that some things went terribly wrong. This is separate from the question of “are these people citizens?” That is a separate, important, but separate issue. Regardless of citizenship, they are human beings, so the question is, to what extent did widespread abuses happen? I think we still have this huge gulf unfortunately between the views of the Myanmar people and the views of the international community. Somehow, we need to find a way, as I said earlier, to have at least general agreement on the facts of what happened. 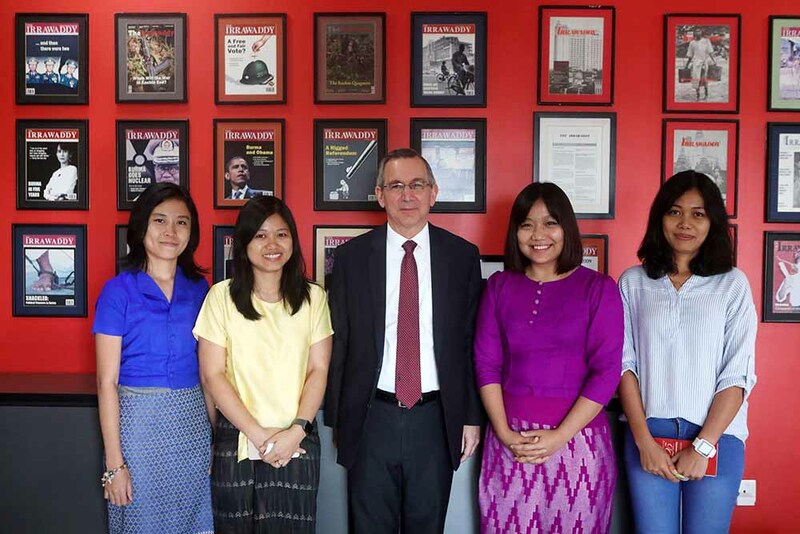 As a former ambassador to Indonesia, you have a lot of knowledge of ASEAN. Much has been written on the decline of democracy in this region, the rise of authoritarian governments, as well as the rise of China. And President Trump came to this region twice, on the North Korean issue, to Singapore and Vietnam. What is the level of US engagement? Has there been a disruption in US engagement with the Indo-Pacific in general? Well, this administration is continuously engaged in the region pretty intensively. And there are always going to be differences. As you said the president was just in Vietnam; Secretary of State [Mike Pompeo] went to Manila for extensive talks and there was a lot of discussion when Vice President [Mike Pence] was in Singapore late last year, including meeting with your State Counselor, which was very important. I think the engagement is still there and commitment to support democracy is still there. There have been setbacks, sadly. But, that is a fact, and when those setbacks happen, we express our concerns but we also think, “OK, how do we try to help move things forward?” You obviously have upcoming elections in Thailand, you have upcoming elections at the end of this month in Indonesia, which has remained democratic. You have elections here of course, next year. My experience goes back a long way. I started my career in the Philippines and my first year there, President Marcos fell to “people power”. This is how old I am. So you know things change. For us, it’s the commitment to try to support democracy, not only the election part of it, because that is important, but all the other things that are so important for a strong court system that people have faith in the justice system, effective police forces, you know, the role of civil society and the independent media. So we are continuing to support those. Some of the details change, but the overall approach remains very consistent. The Yangon regional government is trying to build a “New City”. Did any US companies approach the committee implementing the project about possible involvement? This is a huge and controversial project with significant Chinese involvement. I can’t say for sure whether any US companies have approached that committee about it. It is possible they have. But I would say I am not aware of any company involved in a big way. As you said, the lead seems to be the China Communications and Construction Company. I think the experiences around the world and in the region suggest that there are some elements of Belt Road Initiatives that seem to bring real benefits to the recipient country. And others seem to be quite problematic. I think that is just what we see. It is really important to do due diligence and have maximum transparency. And then the people of Yangon, in this case, express their view—this is a good idea or not a good idea. But I think transparency and [knowing] the details of these projects would be useful. I don’t know if this is going to be a good project or not. I am not qualified to make that judgment. It obviously takes a lot of discussion and debate and I think that is healthy. We would also like to ask your view on the Kyauk Phyu Special Economic Zone project. It is a strategically important area and the Western Companies and a lot of people have expressed concerns about security and other issues. It is a huge project, some people even told me that the police there are Chinese-trained. Right next to a Navy base, a deep-sea port is going to be built. Myanmar people are very concerned about the Kyauk Phyu SEZ and the lack of transparency and accountability surrounding it, as well as the future of the project and Chinese involvement. What is the position of Western governments, including the US? Well, we don’t have a position on the Kyauk Phyu port. It is up to the Myanmar government and the Myanmar people to decide if something is in the interest of Myanmar. I can’t answer that question. I know there has been a lot of discussion about it. And I think that is good. And I guess the other point I will make is that around the world, in places like Djibouti and so on, we have seen what started out of commercial projects become a little bit more than that. And again, it’s not for the US to say this is what should happen, but my impression is the Myanmar government understands that and it is important that these deals be negotiated and—if there is a deal—that Myanmar decides this is in the interest of Myanmar, the interests of the people of Myanmar, and does not compromise sovereignty. That would seem to me [to be] fundamental. It is really up to the Myanmar government. We don’t want to say, “Oh, because of Chinese involvement it’s bad.” No, that is really not how we look at it. It’s [a question of]: what’s the nature of the project? For the sake of argument, let’s say the Chinese were to build a military base near Kyauk Phyu. From a maritime security point of view, what would the US think? We don’t expect that to happen. I think the Myanmar government has made it very clear, publicly, many times that it is not looking for foreign—not just Chinese, but foreign—military bases, and I believe that is true.